Although it's March, I'm anxious for the spring to fully arrive. I've been digging up some Mexican inspired recipes lately in preparation for Cinco de Mayo and came across this recipe for Pork Barbacoa. In the past, I've cooked this in my slow cooker/crockpot but wanted to give it a try in the Instant Pot. 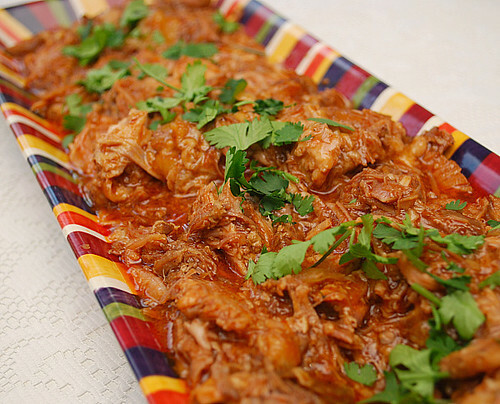 ork Barbacoa is a sweet and spicy dish of shredded pork that's commonly eaten with tortillas. What caught my eye about this recipe was how it only required 5 common ingredients and I loved that I could make it in the Instant Pot without much effort. The recipe involves pressure cooking a pork roast with water, cumin, brown sugar, salsa and a bottle of cola. It seems like an odd combination but it definitely does bring out a nice sweet and spicy flavor! From the original recipe, I did alter the cook time for the Instant Pot and I added minced garlic and diced onion to the roast as it cooks to provide some depth of flavor... and roasting pork in just plain water seemed a bit bland and boring to me. The end result was a delicious pork filling perfect for tacos. Leftovers (which is likely given the large amount of pork called for) can be used to fill empanadas, burritos, chimichangas, calzones, southwestern sloppy joes, top pizzas, in casseroles or whatever ways you'd like to use it up! If you don't have an Instant Pot, you can get the slow cooker/crockpot recipe version here! Place pork roast in IP with the garlic, onion, water, cumin, brown sugar, taco sauce, and cola. Transfer roast to serving dish and shred with two forks or hands. Spoon some sauce over the meat and serve as is with fresh cilantro as garnish or use in your favorite Mexican dish application for tacos, burritos, enchiladas, tostadas, etc.